Justin A. Sattin is a neurologist who is board-certified in neurology and sub-specialized in vascular neurology. Dr. Sattin is a member of the American Academy of Neurology and the American Heart/American Stroke Association. His clinical focus is the prevention, evaluation and treatment of acute stroke, with special interest in developing close collaboration with community hospitals to identify and effectively manage these patients. Dr. Sattin is currently involved in a broad range of NIH and industry-funded clinical research into the prevention and treatment of both ischemic and hemorrhagic stroke. With his colleagues in the Stroke Program, he plans to share the benefits of university imaging facilities and expertise with other hospitals in the region to further improve outcomes for stroke patients. 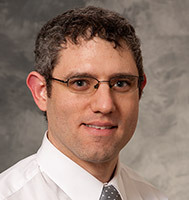 Dr. Sattin’s research currently consists of novel approaches to the emergent treatment of acute ischemic stroke, cognitive and functional outcomes after stroke and secondary stroke prevention.